When I received Brookstone's HDMI Pocket Projector, I expected a user-friendly device coupled with revolutionary technology. This was based of course on my previous experience with the Brookstone Pocket Projector for iPhone. However, the company's newest offering (in a delightful display of versatility for the multi-tasker) has exceeded my already elevated expectations. Brookstone has successfully styled the mullet of projectors: business up front and party in the back. Due to the limited docking space on my overcrowded laptop, I was pleased to find that the Brookstone HDMI Pocket Projector came with an AC adapter to charge its battery. After three hours, the LED indicator literally gives the green light to start projecting. The battery life is about two hours on a single charge; however, you have the option of leaving the device plugged in if you are by a power outlet. An HDMI cable along with a mini and a micro HDMI adapter are included in the package. The set-up is a breeze; simply plug one end of the HDMI cable into the projector and the other end connects into the HDMI port on your device of choice. An added feature is the touch sensitive area on top of the projector used to control the mode and volume. While this particular device is larger in size (3.9"w x 3.8"d x .89"h ) than the Aiptek MobileCinema i20 and the Brookstone Pocket Projector for the iPhone, it weighs just half a pound. As such, Projector Central classifies this device as a pico projector, not a pocket projector. Nevertheless,while it is certainly portable, it is not a projector that I would toss in my purse for my kids' entertainment. This projector is not a novelty item; it is a worthy competitor in the world of pico and pocket projectors. In your real life scenarios section you wrote: "Since the projector is capable of producing up to 1080p HD images, FIFA Street will never be the same for me." Has there been a breakthrough in Pico DLP techology? Or did you mean accepting 1080p? This statement was referring to the projector's ability to produce 1080p images. This projector allows you to use your gaming consoles throughout your home with the same sharp, detailed images that you expect from your television. In this particular scenario, I was able to use the projector to play FIFA Street on the living room wall, while my son watched the Manchester United match on the television next to it. The projector does not sacrifice picture quality for portability. Does the projector work with the iphone 5? Someone I know recently purchased the projector, 30 pin adapter and the new iphone 5 adapter and was unable to get the projector to play anything using the iphone 5. It works just fine on their iphone 4s and ipad 2 (or 3). Hooked Brookstone HDMI pocket projector to my iPad4 yesterday using the proper Apple "Lightning" to HDMI adapter. Would not project anything from iPad. Any idea when Brookstone will update projector to make it compatible with iPad4? Will then buy it if wait not too long. In theory, a good work around alternative for the resolution input incompatibility between the iphone 5 and the ipad 4 with the projector should be resolved using atv (airplay) as a signal bridge, a bit of a hassle but it should work hopefully. Good luck. The native resolution of the Brookstone HDMI Pocket Projector is 854x480. It can accept up to 1080p. I apologize for not being clear on this issue. Thanks for letting me clarify. I have done my research for pico projectors for a while now and I just wanted to share my findings with everyone also interested in purchasing a pico projector. Since I'm always shopping for better technology at a low price, I try to find tech that is overall a great purchase. AAXA's P3 Pico Projector has a high resolution of 1024x600. It's super low cost for it's 50 lumen quality, it's a trusted brand and has been seen on many tech sites and also has been highly reviewed, a full-sized HDMI port, and my favorite, it has a built in media player. All of this in comparison to similar models from Brookstone or 3M, I feel like I definitely made the right choice by going with AAXA's P3 Pico Projector. Is there something you need to do to get a signal from the ipad 2 or iphone 4? I bought the Apple Digital AV adapter, plugged it in and can't seem to get a signal? Any ideas? i want to buy it.Please quote the price. I hooked up the pocket projector to my PS3. Blu Ray looks crisp. Must be at least 70" and looks really good. Best purchase ever from Brookstones. This is a great gadget for on the go presenter. I just recently purchased one from iProjector at http://www.iprojector.ca for $259.99 and love it. I have the same issue with Iphone 4. Works with my Iphone. I tried the 50 lumen class projectors--ended up taking 'em back. The lumens are so low that they actually negatively affect resolution. I've had, for a year now, the ACER K11--200 lumens, extemely versatile. I even use it for our movie club at one of my winter haunts. At home now I don't bother much with my big projectors but use an ACER K330 which gives a beautiful picture for great economy. I received this for christmas, after having seen it demonstrated at the store. However, when I tried to connect it to my verizon iphone 4, it won't receive a signal. Both the projector and the phone are completely charged, and it is on "movie" mode. Thinking it was a compatibility issue, I tried my ipad 2, which didn't work either. Does anyone have a solution to this issue? I have 2 problems with projector. My iPhone 5 "doesn't have installed software" and my MacBook Pro "drawing too much energy from usb hub" (only 1, the projector, in use and plugged into electrical outlet. Works fine with my iPad 2. False advertisement as far as I am concerned. Bought projector and everything That went with it including insurance thinking it would hook up to iphone5 my grandaughter Was very disappointed it did not work on her iphone5. Bought both adapters thinking it Would work. False advertisement salesman insisted it would work I asked several times Are you sure it will work on iPhone 5. Well it does not. Anonymous, I also received my projector in December as a gift. Below are the steps I took to use it with my iphone 4s: 1. purchased a HDMI adaptor 2. plug the adaptor into the iphone 4s. plug the hdmi cable (comes with the projector) one end into the projector the other into the adaptor. 3. plug the usb from my iphone powercord into the projector and plug the other end (use to power phone) into the phone. This worked for me...hope it helps you. Seems my projector won't work on my Iphone 5 or Ipad 4. Any ideas people? How to connect VGA laptop to the hdmi projector. Bluetooth (BT) connector into this projector's hdmi port would allow BT devices -w/ BT tranceiver either built-in or w/ BT connector- to function wirelessly. For ex., Cell phone w/ BT, just need BT connector for projector. Laptop no BT? If has HDMI port a BT transceiver in both Projector and Laptop should work. Does it work with iPad Mini? This works perfectly with both iPhone 5 and iPad 3. Double click the home button, slide all the way to the left and make sure the output is selected to hdmi / attached device. It's been simple and does work! Also, as for a 60" picture... I've run movies and TV shows on a wall at about 120" and it still looks great and focuses well. I love this product far more than the dedicate iPhone projector which only worked when both iPhone and projector were fully charged. Does this projector work good with a ps3?? On iPhones other than the 5, once you attach to the adapter, go into Settings, then General and you will see a TV Out option appear magically. You can then see your video. On the iPhone 5 there is no TV Out and you will have to fork over the money for a lightning to HDMI out adapter at Apple. Both work fine even on iPads. Its fine for ipad 2 and iphone 4, with Ipad mini doesn't work. My problem is that with samsung camera and panasonic video camera the colors red and blue iare changed. Someone has an explanation? I just bought the projector and it does not recognize my computer. even doing f7 not working. I bought a vga to hdmi caable and nothing is working even on my cell phone. My projector works fine on my iPhone4 when I use Netflix I get video and Audio,but when I try to use YouTube I only get audio no video can somebody please help me. I am interested in buying a projector to use to present a live image onstage. I am a magician and would like to project the image of my hands above a table top onto a screen. A few questions. I have an android phone. Can you project live video footage from this. Maybe put into film mode? Could I hook this into a video camera instead to show live footage? Also I heard that you can use this projector in a bright room and still have decent results. What is the minimum distance for this projector to be focused? I have the same problem with a Sony camera. I get no signal with my Samsung 7 pad...was told it would work...ordered a hdmi adaptor and nothing....called store and they didn't know what to do...if they can't make it work I will not shop at Brookstone again. I have the ATT version of the S3 and have not had a problem outputting to the projector. It may be your adaptor. The S3 is very sensitive to which HDMI adaptor you are using. I bought a couple from Amazon - cheap ones - that didn't work or worked only when the stars were in the right placement. I broke down and bought the Samsung branded one. That one works all the time. Also, the power supply - USB port - on the projector does not have enough power to run the Samsung HDMI adaptor. The adaptor needs over 1100 ma and the output is only ~800ma. Use your Samsung supply or even a more powerful one - 2000 ma works great. I bought one and I love it. It works great with my PC because my PC has an HDMI out. I have a netbook without an HDMI out so the projector is useless with that device. Wonderfully clear, bright picture. Does this projector work with the iPhone 5 or the original iPad ? With my Sony cam corder and someone else reports the same problem with Nikon cameras, the real blue colors and combinations are replaced with red color and viceversa. I had my money back after tried other devices . All of theme had the same problem..... :( see You ! My projector does not have the appropriate charger, is there a way to charge the projector on a different device? I was very disappointed the pocket projector did not work with my iphone5 even I tried it with lighting to 30pin adaptor. FYI didn't work so I returned the projector to brookstone. Such disappointed. No it won't work with iphone5!! Mine works just fine with my iphone 5. In fact with LTE it's like I have a truly portable home theater. Best on the fly projector by far!!! Make sure you use the correct audio/video adapter to have the projector work with your phone. Do your research! I have an iphone 5, and it works fine with this projector. However, it sometimes doesn't receive a signal. I'm not sure why. I had it connected to a laptop to test it out--it worked fine. But, then when I connected it again (at a different venue, but same cords and machinery) it wouldn't get the signal! FRUSTRATION! I highly recommend this projector!!!! I use my ps3 to game and stream netflix. I play gta 5 with amazing HD. I actually made an entire home entertainment theater out of this projector. When it says it produces a 60' projection that is[expletive deleted] I have mine at 110 inches. I am getting a cox cable box soon so I can have a Super Bowl party. This is definitely the cheapest Hd projecotor that deserves more recognition for its brilliance. It is the best purchase I have ever made. I am very interested in this projector and had some questions for owners. The main desired use for this is to take with me hiking. The only issue is I would like to have about 4 hours of user. Has anyone been success in recharging this device from something like a new trent external battery charger? I would like a small projector to watch movies and review my photos in my bedroom using my iPhone and laptop. Some people have commented that there phone doesn't work and some say it does. I came across this at the Brookstone store the other day and I almost had an impulse buy. I liked the 2 hr battery that also acts as a portable battery for other devices but for the price I've seen a few other projectors that are cheaper with better projection quality like the AAXA P4-x. 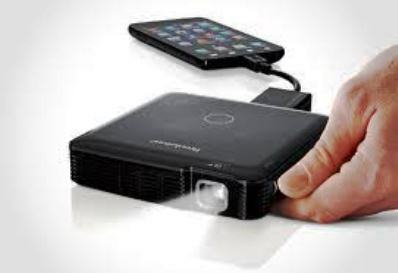 Hi there I have the brookstone pocket projector slim and I have been trying to connect it to my directly into my playstation 3 using the hdmi to hdmi cable and when I plug it in it says no signal can you please help me with how to connect it I would appreciate it. I have a Brookstone Pocket Projector Slim hooked to my MacBook Pro. I cannot get the slides to focus and there is no way that images could be projected up to 60" diagonal as claimed. Any ideas???? I thought this projector was going to be good compared to few others but doing some basic research theres really nothing much to this one. Theres no extra features and its pretty expensive compare to some others. The aaxa has an onboard media player and looks just as bright according to some video reviews. The battery charger thing is ok, but in no way justices the price for it. Just my opinion. I have mixed feelings about this. I use it to play videos off my computer. At this it's great. However, my xbox doesn't work correctly with it. On the right side the image gets messed up. It works while it's booting up, then I get a black bar on the right side. Even when there isn't a black bar the image doesnt show correctly and wobbles slightly after it has been focused. At first it did the same thing with my computer but a few tweeks on the graphics card and it was resolved. We have been trying to get the Playstation to work with this but keep getting a 'No Signal' message. Can you explain how to hook this up so we can play games? Thanks!!! Hey Steve I just bought a pocket projector slim and I've been trying to connect it to my macbook pro with the mini hdmi to thunderbolt cable but its not working. Any suggestions? I love this projecter but how do you know when it's fully charged? I don't see anything that indicates battery life and does it have to be fully charged to play unplugged? This works fine with my iPad and iPod, but not my MacBook Pro. I bought the correct cable - hdmi to thunderbolt, but I still get no signal. Anyone discovered a workaround? I wish to use this projector on my boat wich has a 12 V system is there a way to run and/or charge it from a cigaret lighter plug ? Bought this product yesterday and it looked pretty good in the store. I have a samsung note 2 which I had with me. I wanted to make sure it worked on it before purchase. The sales person helping me tried to connect my phone and the projector together but it did not come with micro connector for my phone. He then said the usbcharger cconnector I use to charge it should work because the projector has a usb plug. Well in the end I bought it when I went home it would not connect. I full charged both projector and my phone and tablet still it would not connect. Finally I called the store and they said samsung phones and tablets do not work on it because samsung does not have a setting to send the vid out. There apparently has to be an output option you have to select to connect the signal. I looked all over both my samsung tablet and phone and it is true I don't have that feature. So frustrating, what upset me more is that this store is not close to me and I have to pay toll to get there. When I called the person on the phone was not the one who helped me but was the one in the background telling him why it wouldn't connect. When I complained and said when I was there yesterday you guys said it would connect his response well im not the one who sold it to you. Really, wow poor service. Although yes im irritated that I feel like I wasted my time trying to get this to work, and now I have to waste more time and money returning it all he had to say was our appologies the prod did not work for you. @ sheryl. The projector works well with Samsung galaxy tab s I think once you get the right HDMI adaptor you she be good. But make sure you plugged both hdmi and USB ends on the back of the projector, then the other end with the adaptor on your Samsung device. @ Ava.. the light should turn green when fully charged. Charges for about 3 to 4 hours before light turns green. For those asking about how to set the focus, there is a very tiny wheel and it's marked , focus, should work. This is a great innovation I am so proud to have one. From about 7 feet projection it gives you same clarity and size a larger projector gives. I only wished it has Bluetooth for sound connection so you can hook it to the new boss Sound mini link for a powerful cinema effect. plz tell me that is any small device or chip is available to display the mobile screen and function on the wall...just like a projector..plz tell me I need it badly......! Worked great for a year and then it wouldn't project. I had my HDMI pocket projector for about a year and it stop projecting. my advice don't get it. that's why it only has a year warrenty. It will be about 55 inches. I suggest ones with tilt adjust and size adjust though. If you do buy a bigger projector get a 3D but understand ones have diffeferent glasses used! With this mini projector u can buy a red blue 3D converter just run hdmi cable maybe vga through it. Then you have three d. But I suggest brighter lumens. It's only ok. GARBAGE! Purchased for work a little over a year ago. Used it about six hours total in that time and now its dead. I took it apart just in case it was an easy LED/bulb replacement and you have to disassemble the entire product, multiple boards, etc. to get to anything. A WASTE OF MONEY, DON'T BUY ONE OF THESE!